WeGo is a cool pushchair designed for your GoTo Seat. It's as lightweight, portable and snazzy-looking as any typical pushchair. But it has some hidden surprises. Firefly is about special needs family participation, helping more children take part in special family moments. 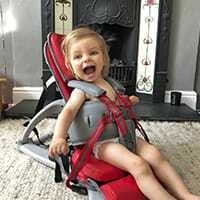 The lightweight, portable, postural support seat for kids with disabilities. 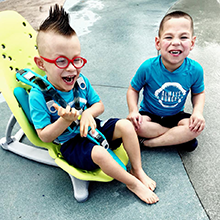 A portable bath seat for kids with disabilities. 4-in-1 mobility rider designed to help children with special needs play, explore and participate. 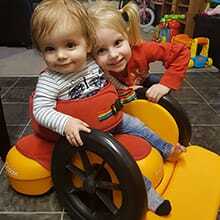 Upright mobility device for children with movement delays. Lightweight activity kit for early intervention therapy at home or on the move. Optional accessories for your Firefly products. 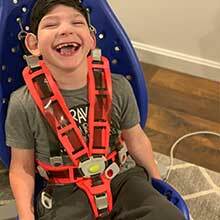 With over 35 years of experience in the design and clinical research of postural support equipment for children with special needs. We know that many children are allergic to Latex, and so Firefly take great care to ensure that all our Firefly products are Latex free. Our products have undergone rigorous testing to ensure they are safe and conform to international standards for medical devices. "Thank you for my Splashy seat! Now I can enjoy the splash park with my brother!" We have Firefly Friends all around the world. Read about how our products enable family participation and inclusion with friends and loved ones. Product webinars, case studies, user manuals and activity programmes to help give you more information about your Firefly product. Find out where Firefly are heading to next, information on upcoming webinars and available training days near you.